One of the main factors leading customers to go to the high-street is the fact that it’s easier to find what you want due to the mass differentiation available. You will never be able to cater to all needs but it is important that you provide enough differentiation to not only please those who want to be experimental with their food but also so you please those customers who want familiar favourites. Below are some important points to consider when considering how to curb the amount of people leave your outlet for the high-street. Knowing exactly what your customers want makes it a whole lot easier to tailor your offering. Are they looking for price, value or taste? Or all three of those? Are there many options near-by that offer what they want? You can find this out simply by paying attention to your customers. Look at what is selling well, and speak to your team to get feedback on how your customers find what you offer, and why they may go elsewhere. If you want to go further, why not send a questionnaire round to scope out what needs and wants your customers have that makes them choose to go elsewhere? For example, if your customers are looking for their food to have health benefits, you could consider using buzzword descriptors on your food to give them more confidence in choosing what is on offer. Simple solutions such as adding labels to highlight food and drink that offer things like “one of your five a day”, “includes superfoods” or “vegan” can help showcase the quality of your offer to those conscious of what they’re eating. If you have any questions on the nutritional value on food you buy from us, get in touch with our Bidfood Advice Centre for support. Another key factor to consider is that 87% of people who bring packed lunch to work do so because they want to have control of the ingredients in their food1. This highlights just how important it is to allow your customers to personalise your offer so they feel satisfied in what they are getting from you and that they are in control of what they are eating. In fact, being able to customise meals is the biggest reason why customers choose to use on-site catering more often2 . If you want more information on why personalisation is a must, please click here to see our previous blog on this subject. Knowing what is happening in the market is an absolute must so you can adapt and meet the changing needs of your customers. If you want to rise above your competitors you have to continually improve and be one step ahead of the competition with your innovation, which is easier said than done when you’re competing with the high-street. Therefore, we recommend that you regularly benchmark your competition to assess who they are, what they have on offer that is taking customers away from your business, and then also to see what is trending in the market, so you can develop these ideas for concepts into your outlets. High-street and food retail style offers that are more customisable for customers when choosing exactly what they want to eat/drink are to be one of the key operator-led growth drivers for contract caterers in the next year3, so when benchmarking, look out for how others are doing this with their offer and see if it links with anything you can do. For support on trends, our in-house Insights team always have their fingers on the pulse. At the start of the year we launched our trends for 2018 brochure which outlines what and how consumers are wanting to eat and drink, now and in the future. You can find all this information here. We also have our New4You magazine which showcases innovative new suppliers and products that are introduced into our range and we can also support with specific new trends with guides such as our Vegan cookbook. The customer journey through your site can have a huge effect on whether your customers continue to visit you, as things like long queues and not finding what they want can be off-putting. Your aim should always be so that your customers travel round your outlet in a smooth way with relevant point of sale at their aid to help with decision making at each point in their journey. Therefore, keep alike products together to not cause confusion. For example, split your snacks by healthier, premium, and classic. To encourage lines that possibly have a higher GP, keep those lines at eye level so that they are easily visible to customers on their journey. Merchandising food and drink in an orderly way so that your customers find what they want easily and quickly provides you with a great opportunity to influence what your customers buy. Our teams work closely with suppliers to create planograms to support you with how to display your food and drink to encourage customer satisfaction. If you would like to know more on this, get in touch with your account manager. Select products that are right for your customer base and strike a balance between household names and new brands. It’s important to get your core range from the bigger brands right as these are the products your customers want and will give you repeat purchases. It’s equally important to surprise your customers and keep your range fresh and exciting with new, innovative options as these are the products that can give your outlet that point of difference. Promotional deals/meal deals communicate value for your offer and are the main reason behind impulsive purchases in sites. They remain popular despite the fact that they are now more challenging to do due to testing conditions caused by rising food inflation, rising operator costs, and generally difficult economic conditions. To combat this, 5 out of 8 leading operators in the high-street have retained their prices but revised their offers4. Healthier ranges tend be left out of meal deals as they tend to be more expensive but this provides an open opportunity to include smaller sized healthier alternatives in your meal deals. Another consideration to make with choosing when to do promotions is the fact that during the week, Friday tends to be the day when consumers are less planned, providing a great opportunity to make use of promotions targeted to this day of the week to sway consumers to staying on site. Making good use of POS for events such as theme days is a great way to engage with your customers with the variety of food you can offer. We have POS toolkits for theme days, like Christmas, Easter and Halloween, ready to support you available on our website here. 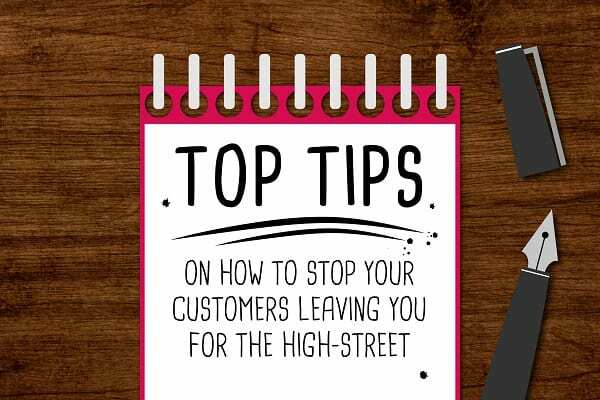 In reality, you will never be able to keep all of your customers from choosing to go to alternatives on the high-street but there is a mountain of things you can do to minimise how many do. When deciding to make these changes, it is essential that you consider the main factors that impact decision making by customers which are: value, taste and quality2. If you are successful with this then you should be able to stem the leaky bucket meaning more customers are satisfied with your offer and, as a result, choose not to go to the high-street. For more top tips on improving your offer, see our other blogs!